Julie Albers made her orchestral debut with the Cleveland Orchestra in 1998 and has performed in recital and with orchestras in the U.S., Europe, Korea, Taiwan, and New Zealand. In 2001 she won second prize at Munich’s Internationaler Musikwettbewerbs der ARD, at the same time receiving the Wilhelm-Weichsler-Musikpreis der Stadt Osnabrück. In 2003 won the gold medal at South Korea’s inaugural Gyeongnam International Music Competition (now the Isangyun Competition). Her performances in North America have included debuts on the San Francisco Performances series and the Grant Park Music Festival where she performed Penderecki’s Concerto Grosso for three cellos with the composer conducting. She has also made concerto appearances with the orchestras of Colorado, Indianapolis, San Diego, Seattle, and Vancouver and with the Münchener Kammerorchester. Her debut album with Orion Weiss is available on the Artek Label. In 2009 Ms. Albers concluded a three-year residency with the Chamber Music Society of Lincoln Center Two. 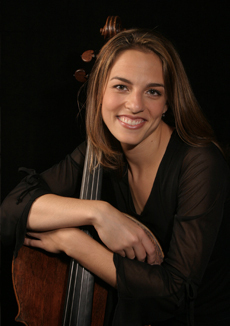 Active with the Albers String Trio and the Cortona Piano Trio, she is an assistant professor and holds the Mary Jean and Charles Yates Cello Chair at the McDuffie Center for Strings. She performs on an N. F. Vuillaume cello made in 1872.